Kineta lies an hour west of Athens, on the south coast of the isthmus that connects the Peloponnese to the Greek mainland. It’s a May morning and the Gulf of Megara shines in the late-spring sunshine, the islands of Egina and Agistri just visible in the hazy distance. Closer in, Alexander Skarsgård – Eric Northman in True Blood – and Florence Pugh – the breakout star of last year’s Lady Macbeth – are walking along the tideline. They’re deep in conversation, making their way slowly towards a bank of cameras. We are meant to be in Naxos, the scene an early meeting between the two principal characters in the BBC’s latest John le Carré adaptation, The Little Drummer Girl, a new six-part series. As Pugh and Skarsgård finish their take and stroll back to the far end of the beach for a second run at the scene, the director, Park Chan-wook – the South Korean best known for his films Oldboy and Stoker – pores over the rushes in a specially constructed tent. Two things about Park (as he’s known by everyone on set) are immediately obvious. Firstly, he’s sensitive to sunlight and directs in a kind of black cagoule, a series of umbrellas held above him at all times. Secondly, he doesn’t speak English, so all communication with the actors goes through his right-hand man, Wonjo Jeong. The little drummer girl of the title is Charlie (Pugh), a charismatic English woman at the end of the 1970s, airily left wing without much commitment to her politics. Her career as an actor hasn’t taken off and she spends her time following her boorish boyfriend, Al, around. They’re on Naxos with a troupe of fellow thespians when Charlie meets a wounded, enigmatic figure on the beach. He offers her a part, one that will change her life for ever. She is enlisted by this man – Becker, a Mossad agent (Skarsgård) – and his Machiavellian superior, Kurtz (played by Michael Shannon), to infiltrate a Palestinian terrorist cell and track down its ringleader, Khalil.Over the course of the tale, she finds herself tested again and again, perceives the shallowness of the political posturing of her youth, and discovers within herself extraordinary resilience and courage. 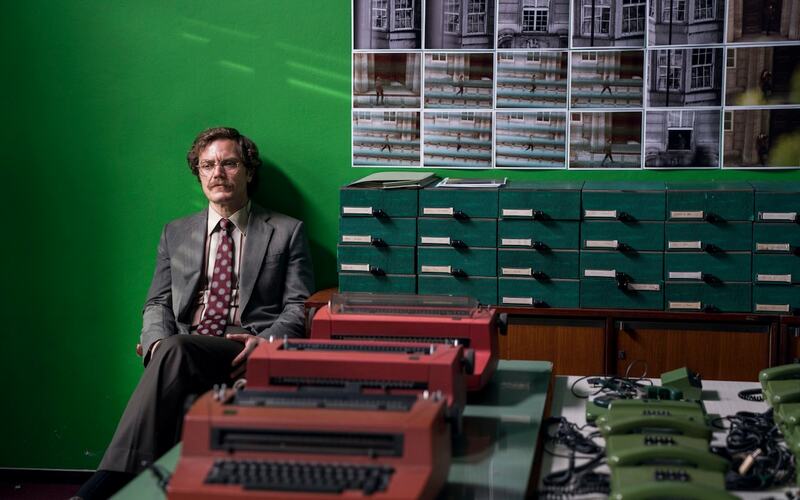 The Little Drummer Girl is produced by The Ink Factory, the company run by le Carré’s sons, Simon and Stephen Cornwell (le Carré’s real name is David Cornwell), who also made The Night Manager and hold the rights to all of their father’s novels. 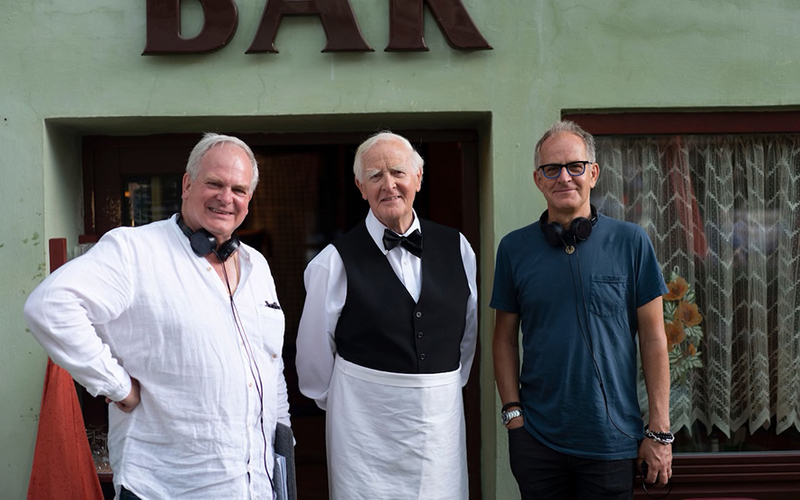 Le Carré is known for making cameo appearances in the films of his novels: he was an irate diner in The Night Manager; this time he plays a waiter in a restaurant scene. I sit down with production designer Maria Djurkovic, in front of a stunning futurist villa, just up the beach from the filming. The beach house looks like it has been snatched straight out of the 1970s, and is meant to be the Tel Aviv hideaway to which Mossad spirits Charlie. The Little Drummer Girl is dizzyingly multi-national: Charlie’s journey takes her from England to Greece to Palestine to Tel Aviv, with various subplots unfolding in Yugoslavia, Germany and Austria. Filming had already taken place in the UK and Athens, with three weeks in the Czech Republic still to shoot. Greece has not only played itself but has also stood in for Palestinian refugee camps and an Israeli beach resort. At this point, having finished filming, Florence Pugh walks up the steps to the villa towards us in a bright-orange dress. Her hair, which has been dyed auburn for the part, catches the light falling down between the pine trees. Pugh, 22, is a relative newcomer, after bursting on to the scene last year with a thrilling performance in William Oldroyd’s brutally compelling Lady Macbeth. She has since appeared as Cordelia to Anthony Hopkins’ Lear in Richard Eyre’s film of the play, but The Little Drummer Girl represents a significant new chapter in her acting life: a role of complexity and subtlety across the broader canvas that six hours of television allows. One of the great challenges for Pugh, she tells me, was the fact that Charlie goes on such an extraordinary journey over the course of the tale. Portraying such change as it happens would be difficult, but the multi-location nature of the filming means that Pugh is called upon to play experience in the morning and innocence in the afternoon. Le Carré’s story takes a very even-handed approach to the thorny politics of Palestine, refusing either to lionise its Mossad heroes or demonise its terrorists. Partly this was the result of a friendship. Le Carré was taken to visit refugee camps in Palestine by the journalist Janet Lee Stevens, who was known as ‘the little drummer girl’. She’d witnessed the massacre of Palestinian refugees at the Sabra and Shatila camps in Lebanon and wrote movingly about their plight. At the age of 32, only a few months before the publication of the novel that bore her nickname, she was among the 63 killed in the bombing of the US embassy in Beirut, an atrocity now viewed as the first Islamic terrorist attack on a US target. In the end, though, she says, there was one thing that they never lost sight of when it came to the conflict: ‘Ultimately it’s a tragedy, and it continues to be one. That’s the story.’ At the end of the day’s filming, the cameras are ranged up along the beach, the light golden, and Skarsgård is swimming a strong slow crawl through the sun-sparkled water. His character, Becker, has been brought back into the fold for a final mission. This swimming scene comes early on, as Charlie is falling for him. I catch up with Skarsgård on the second floor of the villa. We sip iced coffee and I ask him how he got under the skin of such an enigmatic character. ‘With Becker,’ he says, ‘it was about figuring out where he comes from emotionally. What his background was, how he ended up leaving Mossad, the way that what was going on in that region geopolitically affected him so much that he left his career and his wife. ‘That sense of duty and guilt at the same time, that dichotomy created an inner conflict that I found really interesting. Wanting to do something but feeling helpless was core to finding out who he was.’ Skarsgård reminds me that his father, Stellan, starred in 2016’s My Kind of Traitor, another le Carré adaptation. ‘So I’m familiar with this cinematic universe.’ The highlight of this current project, though, he tells me, was the night they filmed at the Acropolis, the whole site opened just for them, the sense of having half a foot in the world of Socrates and Plato. 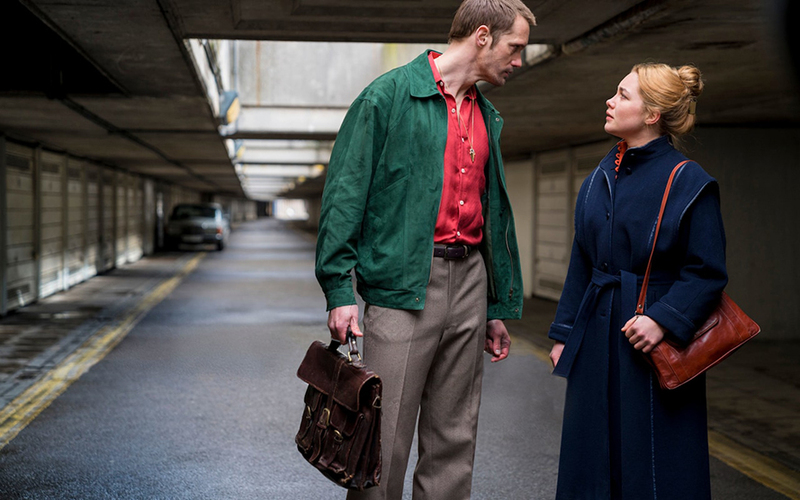 What strikes you more than anything about The Little Drummer Girl is that the fundamental political backdrop has scarcely changed. Park Chan-wook sees it as a testimony to the brilliance of le Carré’s novel that it still speaks to us almost 40 years after it was first published. ‘If the original novel had not been as sensitive as it is to both sides of the conflict I would not have dared adapt it,’ he tells me. The Little Drummer Girl is on BBC One next month.